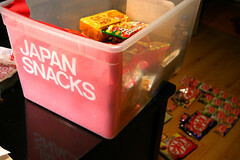 Japanese Kit Kat and snack stash – Just what’s in that bin? After a tweet exchange about the many flavors of Kit Kat tonight, It got me wondering just how many flavors I have collected over time ( I save at least one of each which I hide away from candy-cravings). I was surprised to find that I have only found 14 unique varieties! I need to get to the markets more often! My Kit kat scavenging rule is simple: I must find each flavor organically, meaning no eBaying or asking people to send them to me. This “hobby”‘s all about the joy of the hunt. I would love to try the apple and the brown sugar one… soooo going to ebay right now. I picked up three of them when we were actually in Japan, but the rest all came from the asian markets in San Diego and the LA area. The brown sugar is amazing! also the flan/custard one is a favorite of mine, and green tea is the best. 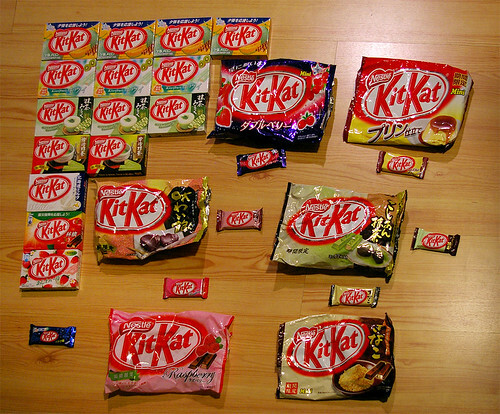 oh, and the other thing that I like about Kit-Kat hunting is that the flavors are all seasonal. so sometimes there are one or two flavors available, sometimes they go months at a time without any kit kats in the stores here. It’s like christmas when you spot the display on the shelf! 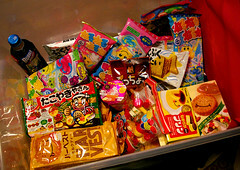 my fave was the ramune flavor, it was blue too! found it at the airport. you’re a great author.I will be sure to bookmark your blog and definitely will come back someday. I want to encourage you continue your great job, have a nice afternoon!